Now that we’re a week after all the Tomato Day hoopla, our tomatoes have quit being shy and are really starting to ripen! 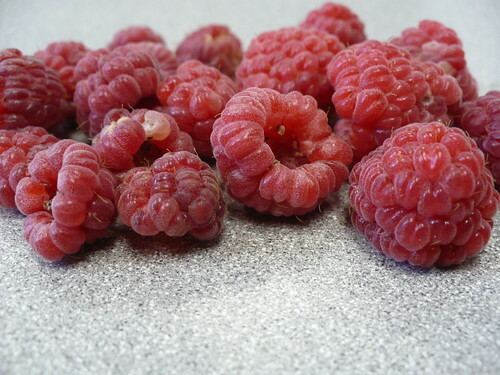 I was out in the garden yesterday and noticed that a marauding squirrel (I assume) had munched on a couple of ripening tomatoes and knocked a couple more off the plants. I also picked couple other tomatoes I thought might be targets over the weekend. 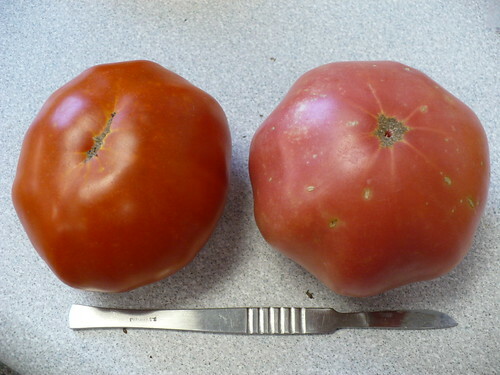 On the left we have one of the Brandymaster Red tomatoes, which we’ve had several of already this year. On the right is our very first Rose tomato. You can see how it got its name! I was actually kind of surprised, because I hadn’t seen any sign of them turning on Tuesday, then all of sudden yesterday afternoon, there they were! I guess I didn’t stop to look at them closely on Wednesday. 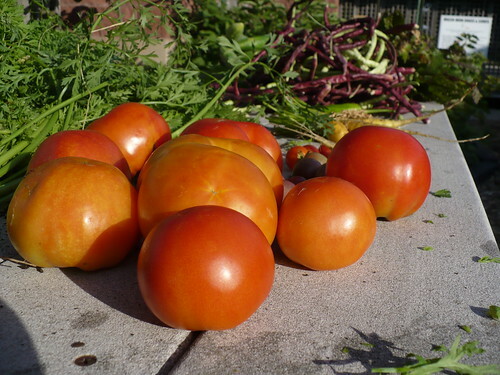 These 3 tomatoes are some of our “heat set” types. The top one is Sunmaster and the bottom two are Solar Fire. 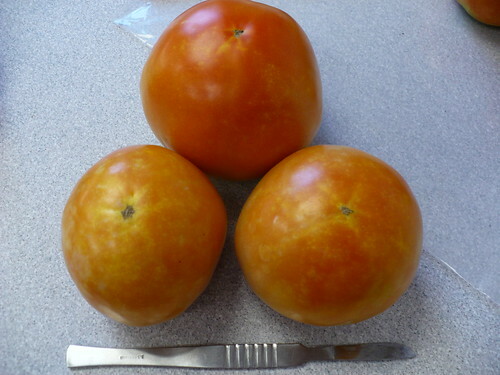 All three are really nice looking tomatoes, although still pretty hard and green, especially on the stem side. The Sunmaster is obviously larger, and I would say that the green tomatoes set on that plant are generally larger than the Solar Fire. The point of a “heat set” tomato variety is that it is supposed to continue setting tomatoes while it’s burning hot…like the last 3 weeks. We’ll see how that turns out for us as this month progresses. Oops! One of our ‘Kermit’ eggplant got away from us! These eggplant tend to turn yellow when they are past the edible stage and into the mature stage. It’s weird…with tomatoes we want our fruit to be completely mature and ripe, but with eggplant, we eat them before they are fully mature, even though we consider them “ripe” at the stage we want to eat them. Or in this case, I would just avoid eating them. Yuck! 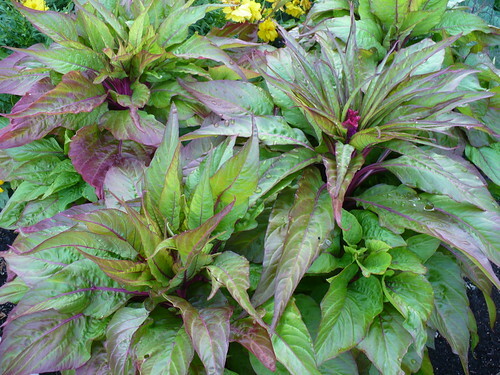 This is a type of basil called Red & Green Holy Basil. 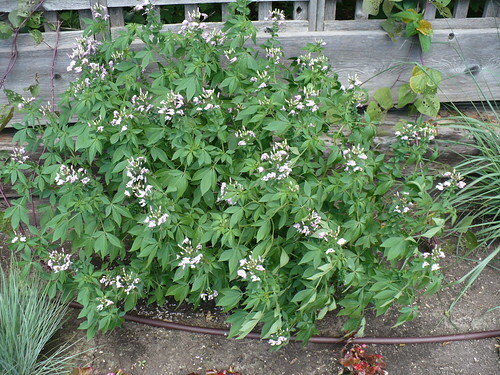 It is a basil that is common on Thai cooking, and it just has a different smell and taste than regular basil. 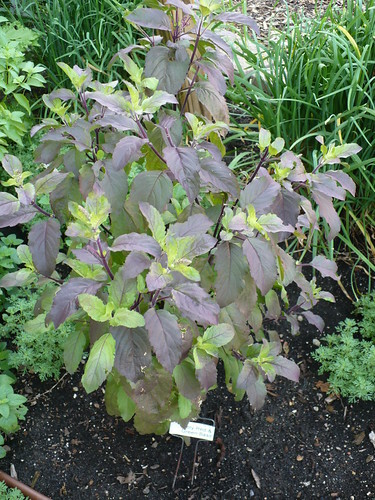 It is spicy, but not as sweet as regular basil. This heirloom flower, ‘WATCH’ Celosia has really been enjoying the heat, unlike most of the other plants in the garden. WATCH apparently stands for Wichita Area Technical College Horticulture, since this flower was selected by the folks at WATC a long time ago. The only way to get some is to save seeds every year, so if you want some seeds you’ll have to come get some later this summer. We’ve had a couple of tomatoes off our ‘Sweet Seedless’ plant, and I have to say that I find the lack of seeds a trifle disconcerting and unnecessary. 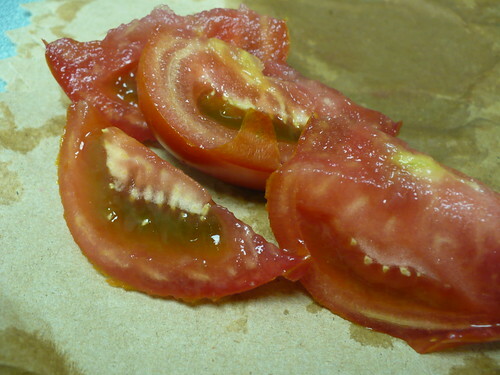 Some people apparently really dislike seeds in their tomatoes though, and for those folks, this tomato is actually quite tasty. 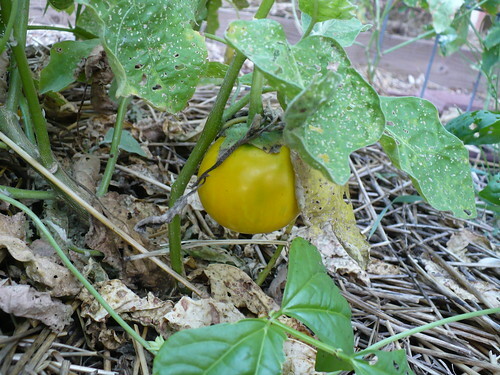 Now that Tomato Day is over, the tomatoes are starting to ripen! We had plenty of cucumbers, tomatoes, Asian peppers, and a few other things to harvest this morning. 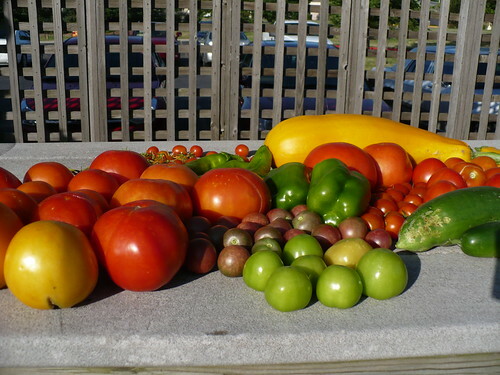 The pale tomato in the corner is one of the Orange Blossom tomatoes, and the green ones in the center are the first of the tomatillos. You can also see that there is a gigantic gold zucchini that somehow was allowed to grow! You would think that since tomorrow is Tomato Day, I would devote this post to all things tomato. Not so! In fact, some of our Prairie Star Annual flowers are looking so beautiful that I have to show them off. 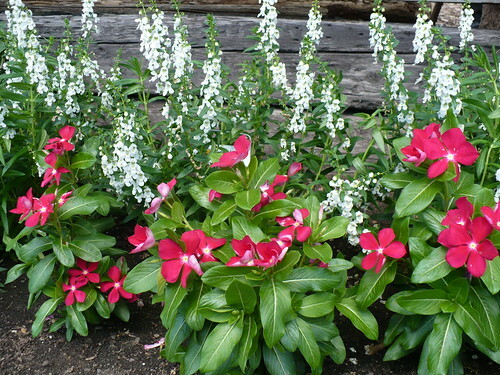 The white Angelonia really sets off the bright pink Vinca. 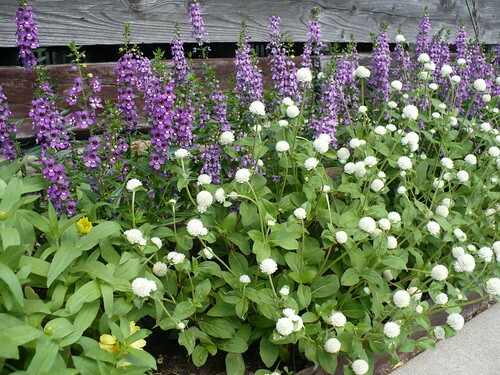 This time there is Purple Angelonia being highlighted by white Gomphrena. Angelonia is one of the newer annuals on the market (like in the last 10 years that I remember), but it is one of my favorites! This ‘Senorita Rosalita’ Cleome doesn’t look as good now as it did a couple weeks ago, but when it is in full bloom, it is really pretty. 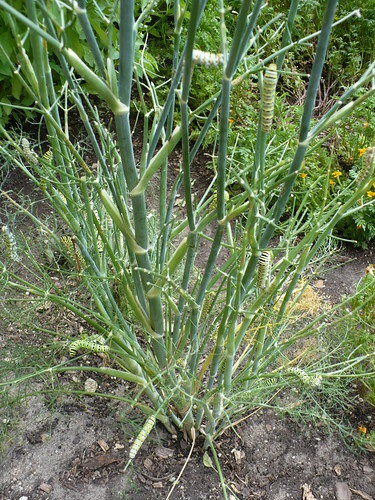 How many caterpillars can you find on this single fennel plant? I’ll give you a hint, it’s more than 10! All right, fine. There’s your obligatory tomato picture. Happy now? Good, we’ll see you at Tomato Day tomorrow!